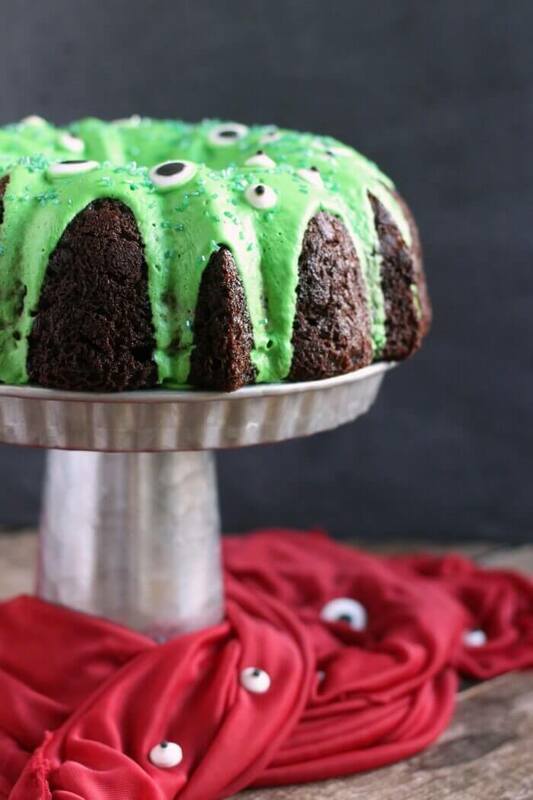 This Monster Bundt Cake will be the hit of your Halloween party! 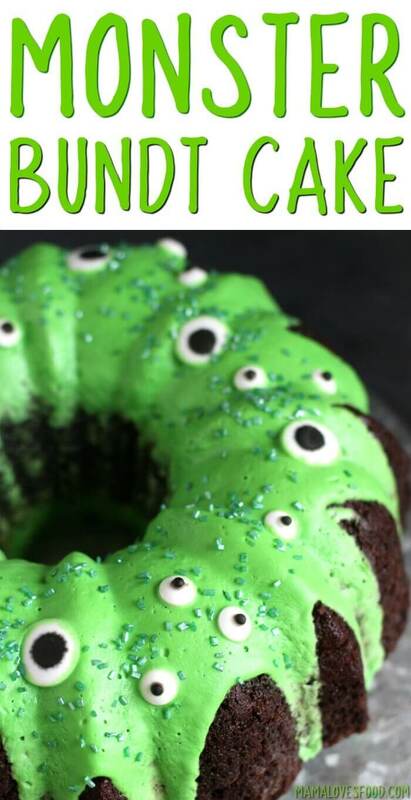 Start with a box cake mix and end with a terrifyingly delicious dessert! 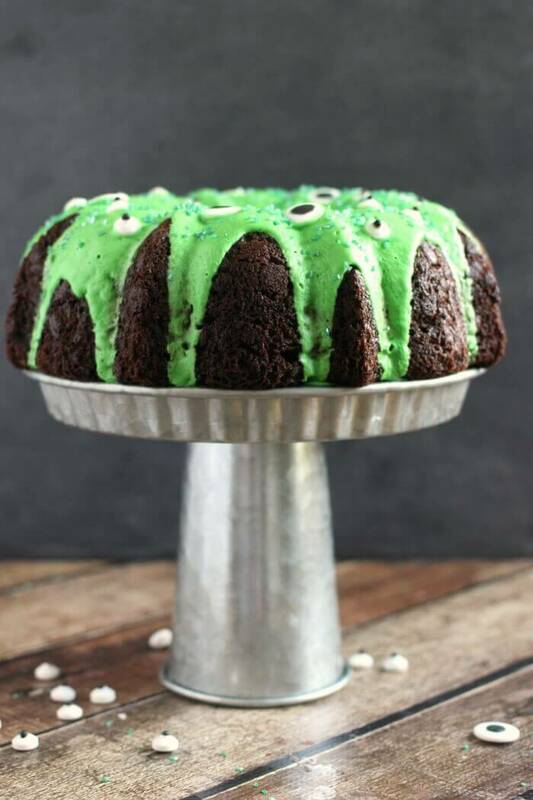 This Monster Bundt Cake was so easy to make and such a big hit in our house! 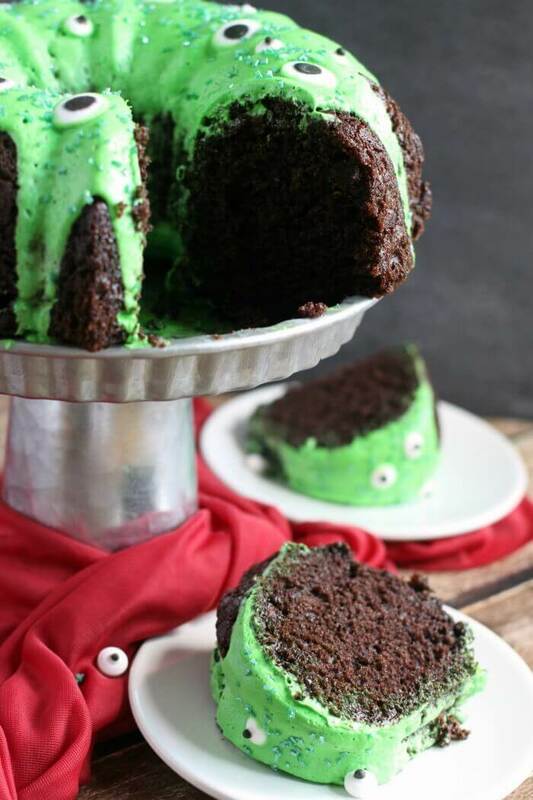 We started with a box cake mix , added our own touch, then finished up with a deliciously creepy green slime icing. The kids loved adding eyeballs and sprinkles to top it all off. Try these other spooky recipes for your Halloween party too: Spider Cookies, I-scream Halloween Floats, Killer Apple Cider Halloween Cupcakes, Murderous Cheesecake Mousse! If you know me at all, you know that baking is not my strong suit. I find bundt cakes a great option because they look polished without any need for talent. We chose to begin with a chocolate cake mix, but any flavor would work well. 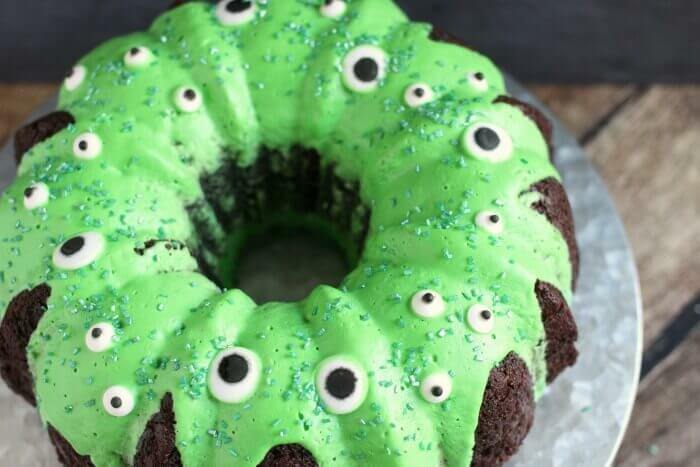 This monster cake is perfect for Halloween, but also a super cute idea for an easy monster birthday party cake! I made a five layer monster birthday cake for my son’s third birthday last year and it was fun, but so hard! You can see the video of us making it below. This monster bundt cake was so much simpler, and go figure, he liked it just as well. Hah! My biggest secret tip when it comes to making a good looking cake, is finding a great cake release recipe. If you want to make one at home, we have the best substitute for cooking spray. Paint it on with a paint brush and get it into alllllll the crevices. Works like a charm! 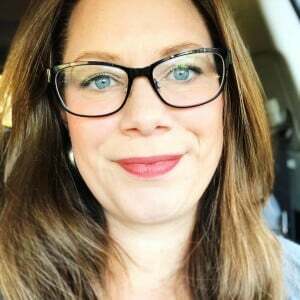 The other alternative (which, let’s be honest, is what I do sometimes), is to purchase a baking release spray from Amazon or the grocery store. The key though is to make sure you get one with flour in it. Seriously, really and truly. This makes all the difference! We used sugar eyeballs and green sugar sprinkles, but you could use as many or few adornments as you like. Maybe some gummy worms in the middle, or squiggled icing to simulate a brain. Don’t stop with creepy stuff – maybe make the icing pinks and purples for a unicorn cake and add allllll the colorful sprinkles! 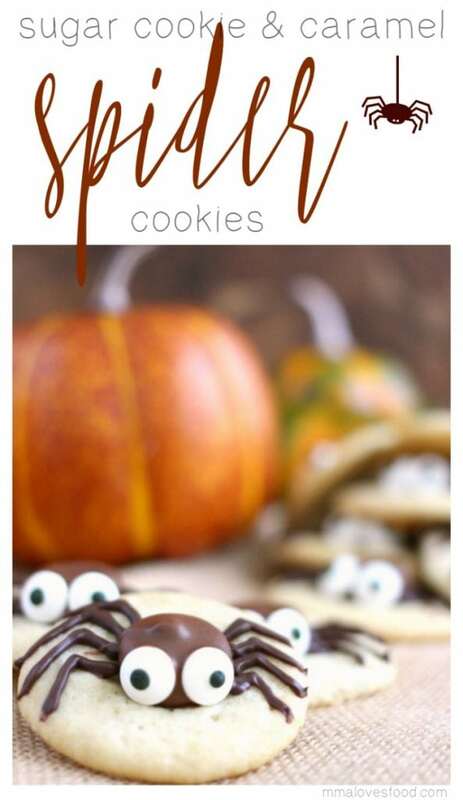 Caramel Spider Sugar Cookies – use Rolos and melted chocolate for a fun cookie treat! 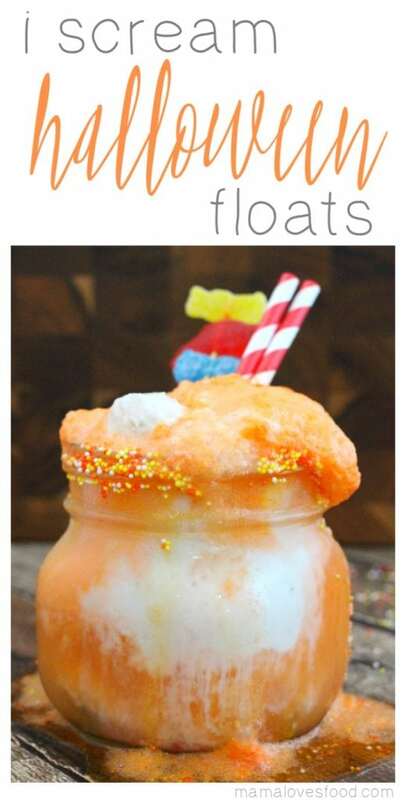 I-scream Halloween Floats – orange soda and ice cream make for a spookily delicious drink. 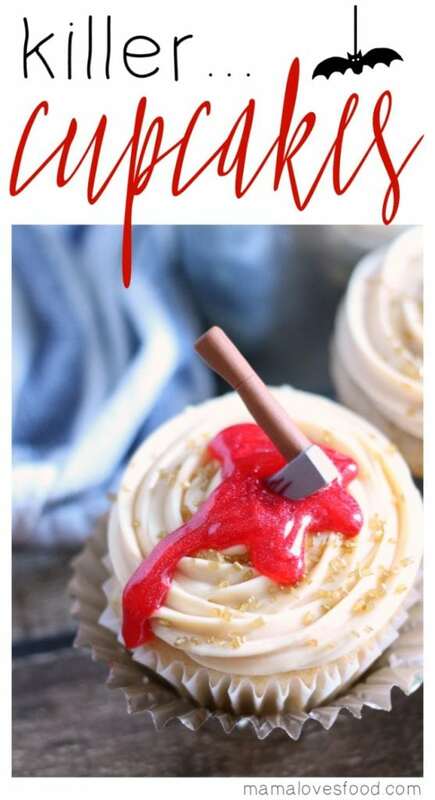 Killer Apple Cider Halloween Cupcakes – these cupcakes are gorgeous, but don’t make them angry. Murderous Cheesecake Mousse – is that strawberry sauce, or something more sinister? Nordic Ware Platinum Collection Original Bundt Pan – this is my very favorite cake pan ever. It’s huge and heavy and fantastic! Chocolate Cake Mix – any brand is fine! You can make it as is, or use our suggested modifications. We heart chocolate cake. Green Sugar Sprinkles – no need to stop at just green if you want to get a little crazy, just go for it! 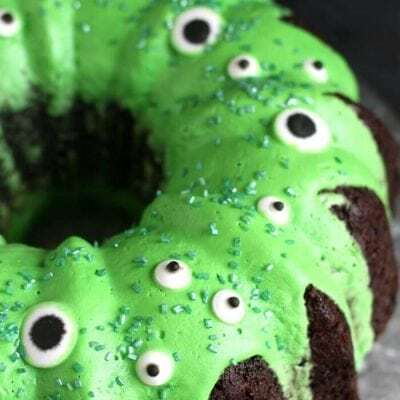 Jumbo Candy Eyeballs – I always have candy eyeballs on hand. Sounds silly but I find them useful more than you’d probably expect. Eyeballs are fun. Small Candy Eyeballs – sometimes I even add these little eyeballs to my kids’ pancakes! 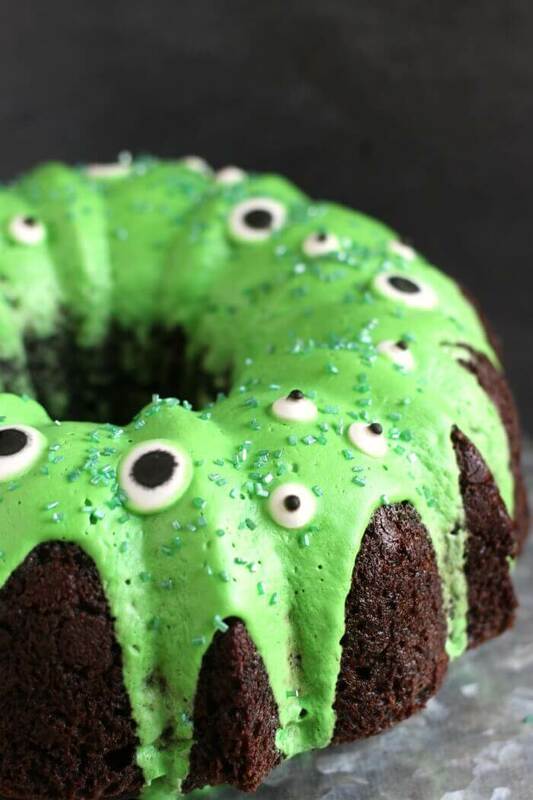 Do you love monster cakes? Watch us make my son a five layer monster cake for his birthday on our twice weekly live show. It was my first attempt at a tall layer cake, and it got a little hairy there for a bit! 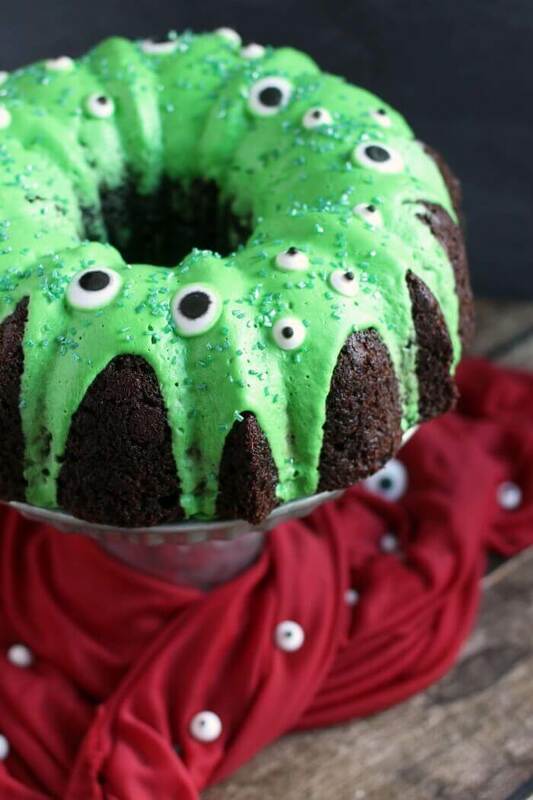 This easy Monster Bundt Cake Recipe will be the hit of your Halloween party! 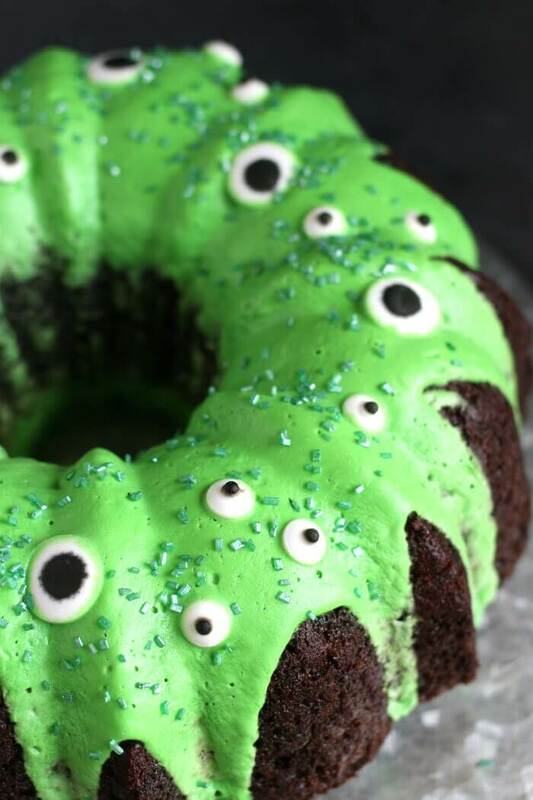 Start with a box cake mix and end with a terrifyingly delicious dessert! While cake is baking, put icing in a bowl and whisk milk into it until you reach a pourable “slime” consistency. Add food coloring, and set aside. When cake is done baking, remove from pan and allow to cool completely. Pour icing over top, then add sprinkles and eyeballs. This cake was such a hit at our party it came out so cute, thanks so much!! When you said +1 egg do you mean in addition to the 3 eggs it says on the box for a total of 4 eggs or only a total of 1 egg? This cake was the highlight of my nephew’s birthday party! It was so easy to make and absolutely adorable. I love your suggestion for an easy homemade cake release. It’s nice to know I don’t have to always run to the store to pick some up – I can make it at home so quickly! Can’t wait to try! May I ask where your cake stand is from?